Paint Shop Pro owns a number of tools for correcting the colours. We explain here only one of them. The screen captures are realized in PSP X but the process is the same with the other versions of the program. It is the perfect tool for doing such a correction with the Digi Grey. - Make a copy of the reference photo (the one where is photographied the Digi Grey) and work on the copy. To make a copy, open the reference photo and save it under another name with the .psp or .pspimage file type (-> File -> Save as). To work on the copy is absolutely needed. 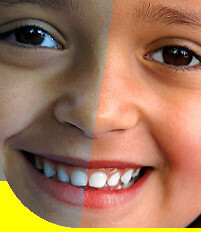 If you modify your original reference photo, you will lose all possibility to correct the colours. - Open the copy to the reference photo. - Activate the "Black and White Points" tool. -> Click on "Black and White Points", maintain the mouse button down and drag it on the menu title "Enhance Photo" on top of the screen. This menu will open and you place the "Black and White Point" tool on the bottom of the list. -> Close the "Customize" window. This will force PSP to correct only the coulours and not the luminosity. With PSP 9, the first click with the dropper must be done in the image open in the workspace and not in the Preview window. It is a bug that has been corrected in PSP X. - Cick on OK to apply the correction. You may close the reference photo. - It is easy now to correct the other photos taken under the same lighting. Open them and click on he "Black and White Points" tool. - Click on OK to apply on the photo. Do it for each photo. - If you have many photos, you may record in a script the setting made on the reference photo and apply it with a batch process. 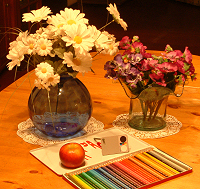 Other tools are available for correcting the colours in PSP with the Digi Grey, for example "Manual Color Correction" or "Color Balance". The last one is a new tool introduced in PSP X. You may also use in PSP the free PowerRetouche plug-in.